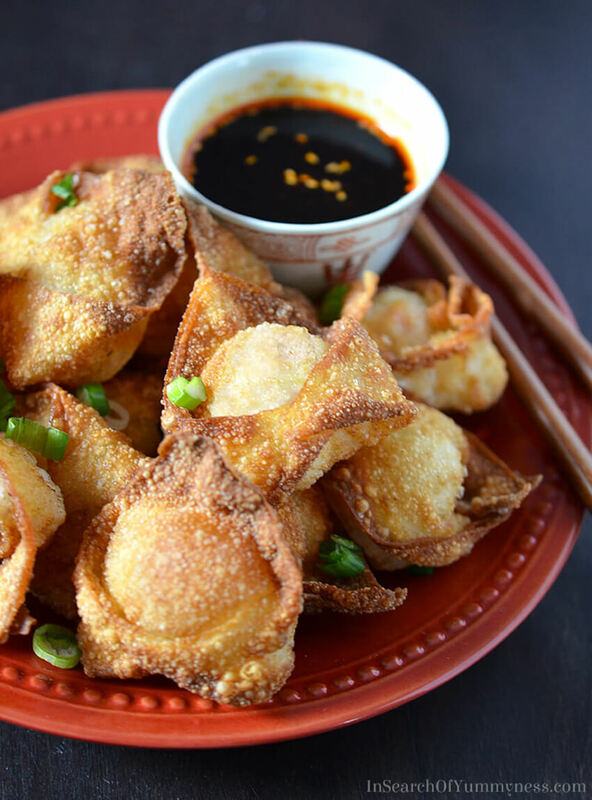 Crispy fried shrimp wontons are easier to make than you might think! Read on for step-by-step instructions. The Lunar New Year (or Chinese New Year) is an important time for me, because it marks the anniversary of when I re-launched this blog. I never seem to accomplish much in January, so starting the new year in February works much better for me! I also have friends who celebrate this special holiday, so I wanted to create a recipe to mark the occasion for them as well. 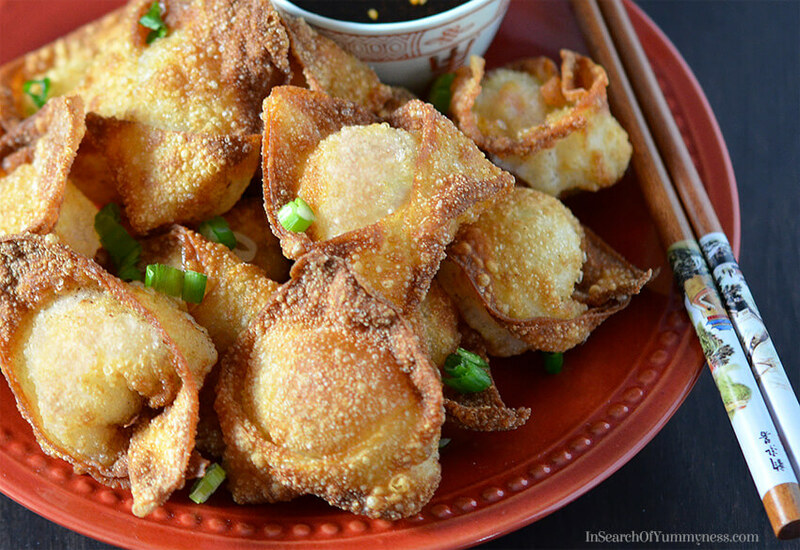 Today I’m sharing my recipe for fried shrimp wontons with mushrooms. Wontons are a type of Chinese dumpling, which consists of a thin dough (called wonton skins) filled with minced meat, seafood or vegetables. They can be prepared in several ways, including steamed, boiled or fried. You may be familiar with wonton soup, for example. When fried, these crispy dumplings make are a wonderful appetizer, which pair well with various dipping sauces. I’ll talk more about the sauces in a minute. 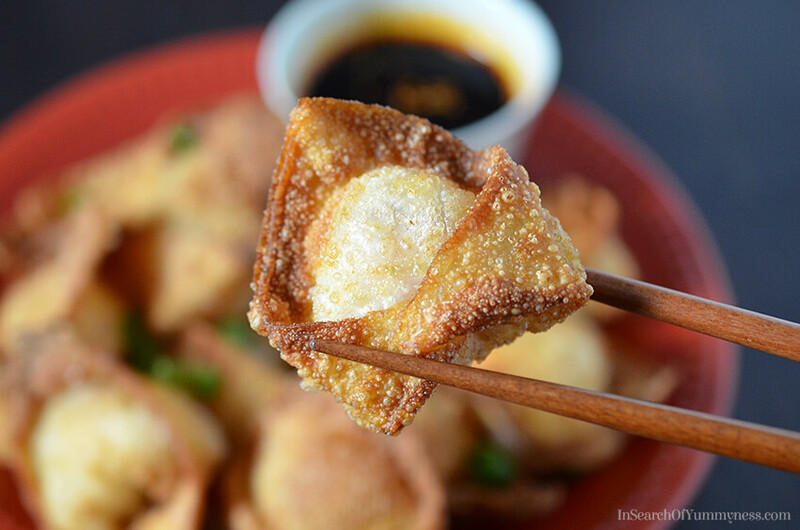 My mom used to make fried wontons as a treat for my brother and I when we were children, and now I crave them when I want comfort food. My favourite filling is shrimp with a touch of ginger, because that’s what I grew up with. For this recipe, I used a combination of shrimp and king oyster mushrooms in these wontons. My local big box grocery store carries king oyster mushrooms, but if you can’t find them, you can use regular white button mushrooms instead. If you’re not sure what king oyster mushrooms are, check out this page from Mushrooms Canada. They have information about all of the different kinds of mushrooms that are available in Canada. You can find wonton skins in more large grocery stores – usually in the refrigerated section. The best wontons skins you can get are the frozen ones from Asian speciality markets, but remember that these need to be defrosted in the fridge overnight, or for about an hour on your counter, before you can use them. Wrapping the wontons might seem complicated at first, but the task becomes easier with practice. The key is to not add too much filling to each wrapper. Too much filling makes the wontons difficult to fold, and sometimes they will burst during cooking too. You should also make each wonton one at a time, and leave the rest of the skins covered with a slightly damp towel to prevent them from drying out. Your wontons will taste delicious no matter what shape they are, but one of the easiest shapes to make is a triangle. To start, wet the edges of the wrapper with some water to make it tacky, then use your fingers to press along the edges to tightly seal the wonton. Once you’ve removed all of the air from the dumpling and sealed it shut, you can move on to the next one. I personally like to make a pouch shape for my fried shrimp wontons. Start by making the basic triangle above, then apply some water to the bottom points. Fold in each point towards the middle of the triangle (like doors) to make the pouch (shown below). Alternatively, you can make a triangle, then make push down between the two bottom points with your finger. This makes a little dent in the dumpling. Then pull up the two bottom corners and stick them together to make a flower bud shape (which looks like Italian tortellini). That’s my mom’s signature wonton shape, which you can see floating in a pot in the photo below. As you fold each wonton, put them on a plate or baking tray (lined with parchment). Your wontons might be a bit wet if you were heavy handed with the water, so if needed let them dry out a bit. Remember that water and hot oil don’t mix! The drier the wontons are, the less likely you are to get burned. You may need to flip them over to dry out both sides of the wontons before you fry them. 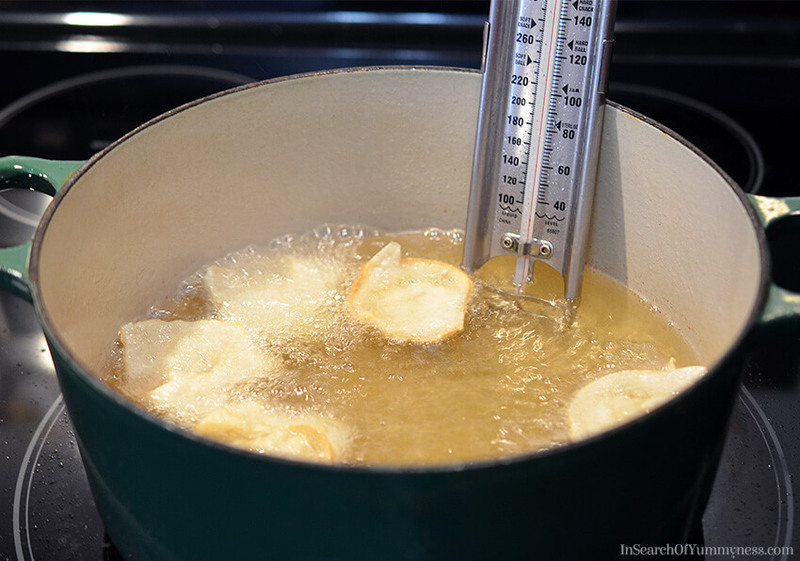 I like to use a deep pot to fry my wontons, but if you have a deep-fryer that might work too. These only take a minute or two to cook though, so be careful not to burn them! Once the wontons are golden brown all over, remove them from the hot oil with a slotted spoon or a spider strainer . Then rest them on a plate lined with paper towels to absorb the excess oil. If you keep your oil hot enough (around 375°F) your wontons shouldn’t be too greasy. That being said, if you find that your wontons are browning really quickly, but your filling isn’t cooking through, you will need to lower your temperature a bit so the wontons can spend more time in the oil. These fried shrimp wontons are nice on their own, but they are fabulous with a good dipping sauce. You can use a ready-to-serve sweet chilli sauce or try plum sauce if you’re serving these to children. While not traditional, Sriracha mayonnaise pairs really well with these wontons, and you can easily whip that up by combining a few spoonfuls of mayonnaise with a squirt of Sriracha Hot Chili Sauce. My favourite sauce is a spicy soy-based dipping sauce, which I’ve included in the recipe below. Again, it’s not traditional, but I like the spicy and salty kick that it gives to these fried shrimp wontons. These crunchy fried shrimp wontons are best eaten immediately after cooking. Serve them with a simple dipping sauce and enjoy! In a bowl, combine the shrimp, mushrooms, green onions, sesame oil, ginger, garlic, salt, pepper and cooking wine. Stir until thoroughly combined, then set aside. Add water to a small bowl, and place it nearby. Peel off one wonton skin from the pack, then cover the rest with a slightly damp towel so they don't dry out. 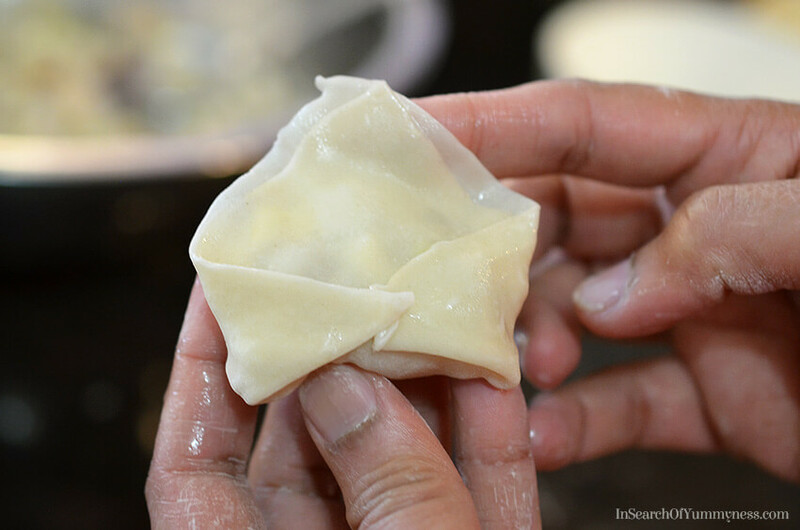 Use a spoon to add a small amount of filling to the middle of the wonton skin. Be careful not to add too much, or your wontons will burst while cooking. 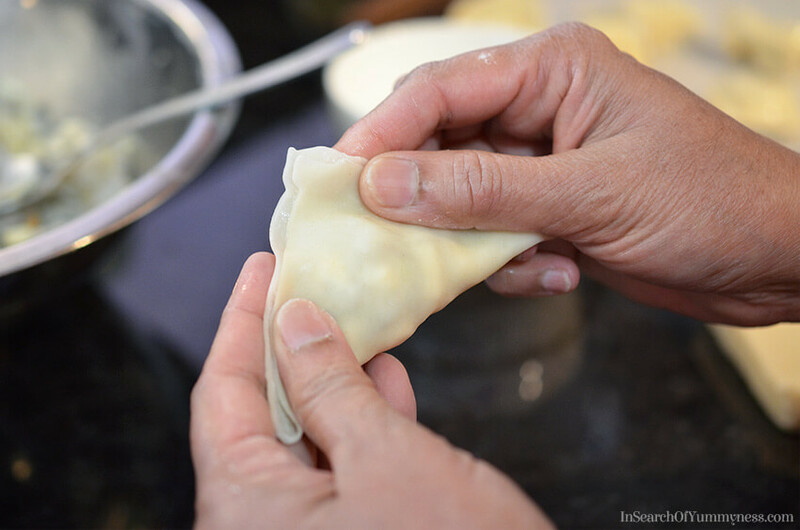 Use your finger to moisten the edges of the wonton skin. Then fold it in half to create a triangle. Press down the edges to seal the wonton, making sure to remove as much air as possible. You can leave the wonton as a triangle, or continue folding into desired shape. Place wrapped wonton on a tray lined with parchment paper, and then continue to make the rest of your wontons. Fill a deep heavy pot with cooking oil until it fills about 1/4 of the pot. Heat the oil to 375°F. While the oil is heating up, line a plate or tray with paper towels and set aside. Once the oil is hot, carefully add a few wontons to the pot. Fry the wontons, turning them as needed, until they are golden brown all over. This should take 2-3 minutes. Use a strainer or slotted spoon to remove the cooked wontons from the hot oil. Place on prepared plate or tray to drain. Cut one of the wontons and check to make sure the filling is cooked. If it is still raw, reduce the temperature of your oil a little so the wontons can spend more time in the hot oil. Eat cooked wontons immediately for best texture. Tip: If your wontons have become wet because you used too much water to seal them, allow them to dry out before you fry them. You may need to flip them over to dry both sides. Thanks Nuran, I hope you try it soon! Shrimp wontons are my favourite! I really hope you try making these soon Maggie!